Jeong, J. S., Jung, C., Seo, J. S., Kim, J. K. and Chua, N. H. (2017). The Deubiquitinating Enzymes UBP12 and UBP13 Positively Regulate MYC2 Levels in Jasmonate Responses. Plant Cell 29(6): 1406-1424. Seo, J. S., Sun, H. X., Park, B. S., Huang, C. H., Yeh, S. D., Jung, C. and Chua, N. H. (2017). ELF18-INDUCED LONG-NONCODING RNA Associates with Mediator to Enhance Expression of Innate Immune Response Genes in Arabidopsis. Plant Cell 29(5): 1024-1038. Nam, K. H., Kim, D. Y., Pack, I. S., Park, J. H., Seo, J. S., Choi, Y. D., Cheong, J. J., Kim, C. H. and Kim, C. G. (2016). Comparative analysis of chemical compositions between non-transgenic soybean seeds and those from plants over-expressing AtJMT, the gene for jasmonic acid carboxyl methyltransferase. Food Chem 196: 236-241. Jung, C., Zhao, P., Seo, J. S., Mitsuda, N., Deng, S. and Chua, N. H. (2015). 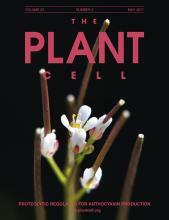 PLANT U-BOX PROTEIN10 Regulates MYC2 Stability in Arabidopsis. Plant Cell 27(7): 2016-2031. Park, B. S., Seo, J. S. and Chua, N. H. (2014). NITROGEN LIMITATION ADAPTATION recruits PHOSPHATE2 to target the phosphate transporter PT2 for degradation during the regulation of Arabidopsis phosphate homeostasis. Plant Cell 26(1): 454-464. Kandel, S., Sauveplane, V., Compagnon, V., Franke, R., Millet, Y., Schreiber, L., Werck-Reichhart, D. and Pinot, F. (2007). Characterization of a methyl jasmonate and wounding-responsive cytochrome P450 of Arabidopsis thaliana catalyzing dicarboxylic fatty acid formation in vitro. FEBS J 274(19): 5116-5127. Seo, J. S., Koo, Y. J., Jung, C., Yeu, S. Y., Song, J. T., Kim, J. K., Choi, Y., Lee, J. S. and Do Choi, Y. (2013). Identification of a novel jasmonate-responsive element in the AtJMT promoter and its binding protein for AtJMT repression. PLoS One 8(2): e55482. Jung, C., Kim, Y. K., Oh, N. I., Shim, J. S., Seo, J. S., Choi, Y. D., Nahm, B. H. and Cheong, J. J. (2012). Quadruple 9-mer-based protein binding microarray analysis confirms AACnG as the consensus nucleotide sequence sufficient for the specific binding of AtMYB44. Mol Cells 34(6): 531-537. Seo, J. S., Sohn, H. B., Noh, K., Jung, C., An, J. H., Donovan, C. M., Somers, D. A., Kim, D. I., Jeong, S. C., Kim, C. G., Kim, H. M., Lee, S. H., Choi, Y. D., Moon, T. W., Kim, C. H., Cheong, J. J. (2012). Expression of the Arabidopsis AtMYB44 gene confers drought/salt-stress tolerance in transgenic soybean. Mol Breeding 29: 601-608. Jung, C., Shim, J. S., Seo, J. S., Lee, H. Y., Kim, C. H., Choi, Y. D. and Cheong, J. J. (2010). Non-specific phytohormonal induction of AtMYB44 and suppression of jasmonate-responsive gene activation in Arabidopsis thaliana. Mol Cells 29(1): 71-76. Jung, C., Seo, J. S., Han, S. W., Koo, Y. J., Kim, C. H., Song, S. I., Nahm, B. H., Choi, Y. D. and Cheong, J. J. (2008). Overexpression of AtMYB44 enhances stomatal closure to confer abiotic stress tolerance in transgenic Arabidopsis. Plant Physiol 146(2): 623-635.